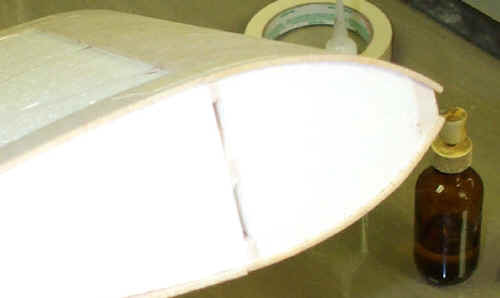 The Hybrid foam wing design is a variety of techniques combined to create a wing that has all of the benefits that built up and foam construction has to offer. Foam wings have been around in modeling for some time and have seen success in the winners circle in control line aerobatic airplanes along with numerous R/C planes. The weight of the finish product is dependant on three things, wood selection (density), foam density (preferably 1# per cubic foot), and glue volume and weight. The lamination adhesive was more often than not the reason for overweight wings. 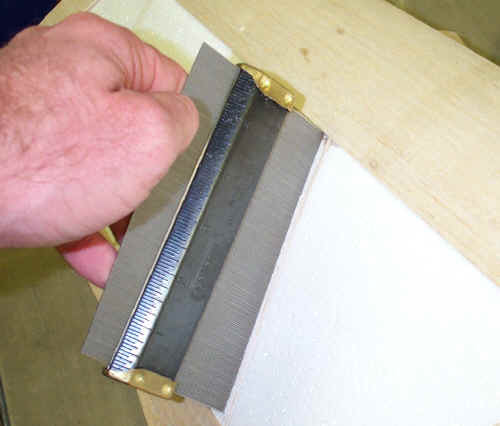 There are basically two types of glues used to laminate the sheeting on to a foam wing, contact adhesives and standard types such as epoxy and the new variety of pro bond types. I do not have any experience using these pro bond type adhesives so I will not be able to offer any advice concerning them. The people that talk of using them say they work well. If used in conjunction with a vacuum bag they might be an alternative to epoxy. I have chosen epoxy for it's weight savings and the fact that I have gallon containers of various types in stock. I originally used the contact type adhesives to apply sheeting such as the 3M 77 and the Sig core bond and a variety of others. If you are going to use any of these systems remember to do a compatibility test first on some scrap. I have heard reports that 3M 77 has undergone a formula change that attacks the foam. The drawback with these contact type of adhesives was the weight. 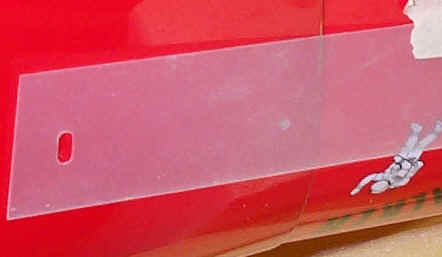 The 3M 77 was probably the lightest of all the contact adhesives since you had good control of the amount applied. For the 3M 77 to work the two surfaces (wood and foam) had to be sprayed and the pieces joined while the adhesive was still aggressively tacky. If the 3M 77 was allowed to dry you lost the bonding action. Timing was very critical when using this method. I found that you could get some of the 3M 77 on your fingertips and keep touching the wood until your fingers don't want to release from the wood as an indicator that it was aggressively tacky. Other contact adhesives would have to be dry before the sheeting and foam could be joined. In some cases if the contact cement wasn't dry you risked the chance of some of the solvents attacking the foam. One of the major drawbacks of the brush on contact cements in my opinion was the tendency to over apply the adhesive. About half of the adhesive would end up between the foam beads where it served no other purpose than to add weight. Although the contact glue method was heavier I still had good luck with it holding up under the lifespan of the model which was around five to ten years with some still going. One advantage of the contact type adhesives was the fact that they were quick. No need for weights and the cradles that the wings came in didn't have to be straight since you would roll the wing down on the sheeting which was sitting on a straight and flat workbench. Only one chance to position here, once the wing came in contact with the sheeting it couldn't be repositioned. After a few years passed I started to experiment with composites and fabricate some parts with various materials such as carbon fiber fiberglass and industrial epoxies. The more that I worked with different processes such as vacuum bagging the more I realized that the different materials and processes could be combined to compliment each other. Anyone in the manufacturing or composite business will tell you that the PROCESS is the vital ingredient in either success or failure. The process can vary greatly when the quantity of items produced changes which is a subject for another web page in itself. After a few test samples of vacuum bagged balsa over expanded bead polystyrene were completed I was amazed with just how little epoxy resin was needed to bond the wood to the foam. There is a saying that states that a chain is only as strong as its weakest link. So if the bond between the foam and wood is good enough or strong enough to pull the beads of foam away upon delimitation then it's strong enough. Adding expanding glue such ad pro bond that expands into the beads just adds extra weight in my opinion. Remember that the beads will still fail where the glue line ends so extending the glue deeper in the foam just determines where it will fail without making it stronger in my opinion. I also experimented with adding carbon veil under the sheeting with success. Carbon veil was used on a R/C pattern wing in the section of the ailerons for added rigidity. Epoxy resin is only added to the sheeting. It is poured onto the wood and spread with a scraper or spatula. Enough pressure is applied while spreading the Epoxy to make the wood appear dry. My theory is that there is enough epoxy forced into the grain of the wood to allow for sufficient bond. Under vacuum the resin is drawn out of the grain to make contact with the foam. The total amount of vacuum should not exceed 8 inches of mercury on 1# expanded bead polystyrene or you will crush or distort the foam. Higher vacuums could be used on denser foams but that would add unnecessary weight. In Control line Aerobatics we core the wings out span wise to lighten them along with giving the leadouts a tunnel to the bellcrank. I applied 8 inches of vacuum to a cored out control line wing and the result was not pretty. If the hollowing cores are slipped back into the wing the wing still distorts so the only alternative is to core the wing out after vacuum bagging. By coring the wing out after sheeting allows more foam to be removed than would be possible otherwise. Even with all of these weight savings the wings were still not as light as a built up wing. After all there is nothing in a wing as light as air so the more air you can put in a wing the lighter it will be. After cutting numerous foam wings I hated to give up on the speed of build, stability and accuracy the foam wing presented so I decided to incorporate all of the things I liked of each method (built up and foam) of construction until I had the best of both worlds. The picture above depicts my progress up to this point. Ok so you have this foam wing and you want to make a hybrid wing from it so how do you go about it? The foam wing in this method is used as a three dimensional template so to speak. There are computer programs out there that will plot and design rib sections at any angle and will figure out any geometric problem that will arise. These programs are expensive and have steep learning curves involved. Once the cost of the program is overcome and you have mastered the program to produce the results you are looking for you now have to incorporate the software into a machine to produce the parts such as laser cutters or CNC routers etc. Once these accurate parts are cut out then you need a fixture to hold these parts together while gluing them. As stated above (the process can vary greatly when the quantity of items produced changes) CNC machines, CAD programs and laser cutters are invaluable tools for producing parts and designing but leave these programs and machines to the people who are producing in large enough quantities to justify their cost. Why design ribs on a cad machine when you can drop wood blanks into slots in the foam wing and sand to the right contour? The foam wing acts as a fixture to hold the strip ribs while providing the exact contour regardless of the orientation of the rib. This picture shows the root of the wing in the top right corner of the picture. The foam will remain in tact in this area. The full span built up spar was installed in the first step where the wing leading edge was removed span wise from the high point forward. 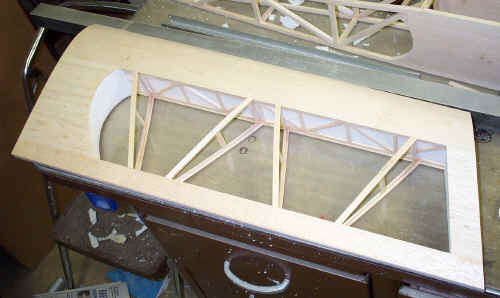 The spar was tack glued in place between the remaining wing sections fore and aft. There is no need to completely glue the spar in place since the foam will be removed in future steps. A warren truss construction was chosen for the spar since it is light weight and strong. Don't worry about making the spar the exact depth of the wing. 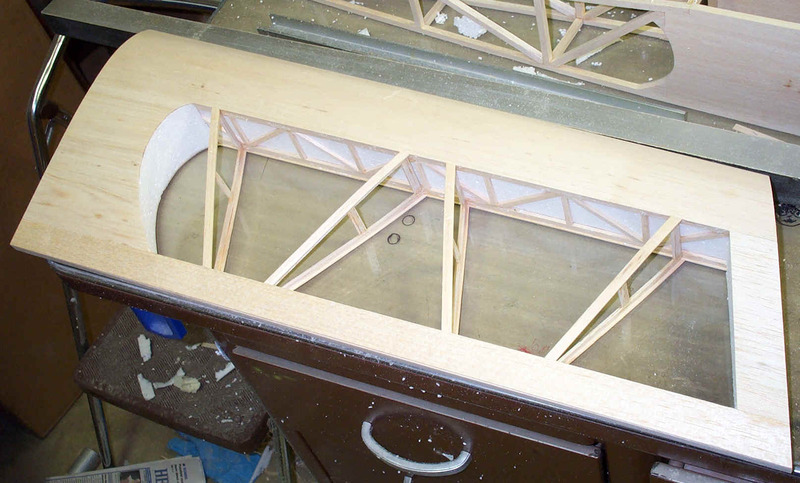 I chose to make it slightly oversize (too tall) and sand sown to the height of the foam wing leaving it sticking up a few thousands to make sure there would be a good bond between the sheeting and the spar. The vertical braces shown between the top and bottom ribs were added after the foam was removed. The leading edge was tack glued in place and sanded to conform to the shape of the foam while leaving the front flat and squared off. 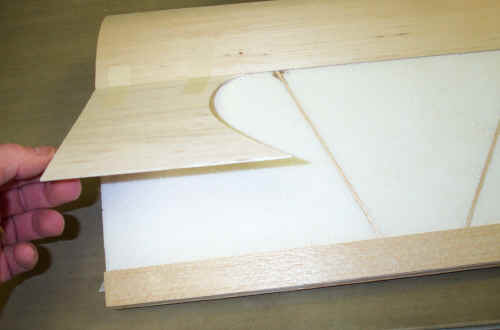 The balsa leading edge should follow the contour of the foam but not be radiused yet since the sheeting will be bagged down over the top of it as shown here. Once the spar and the leading edge are tack glued in you can start cutting the slots for the ribs to go in. The slots for the ribs to go into were cut with a soldering iron with a stop set up for the correct depth. I chose to make my strip ribs about 5/16 deep. The depth of the ribs are dependant on the size of your wing. A See Temp template was made up with the rib locations on it so that the top rib would be over the bottom rib. the ribs can be positioned at any angle or spaced at any interval since they become an exact duplicate of the wing surface once sanded flush with the foam. 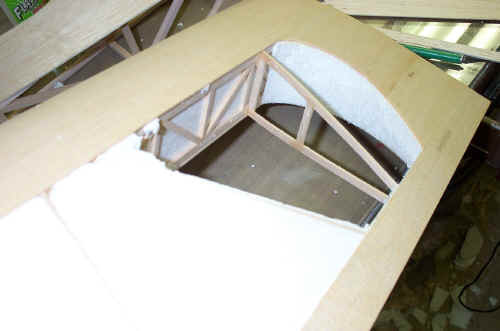 By placing the ribs at an angle I believe that the wing becomes a little less prone to twisting or torsional stresses. Once the strip ribs are glued to the spar then the trailing edge can be added. There are no ribs forward of the spar since the foam and sheeting will provide the leading edge shape. This picture was taken after the fact since you will not have the leading edge or trailing edge sheeting in place at this time. At this point you should have the spar, leading edge, ribs and trailing edge in place and ready to add the sheeting. The ribs should be permanently glued to the spar and trailing edge at this time. The sheeting shown here is vacuum bagged in place. 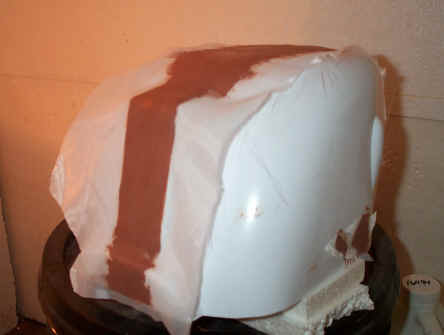 Masking tape is used to hold things in place prior to bagging. I vacuum bagged the sheeting in two steps. The first bagging was for the leading and trailing edge sheeting and the center section and tip sheeting were added in a second bagging. I wasn't sure I could get all of the sheeting to line up correctly by bagging all of it at once so I chose to be safe and do it in two steps. The wing after the foam has been removed from between the ribs. 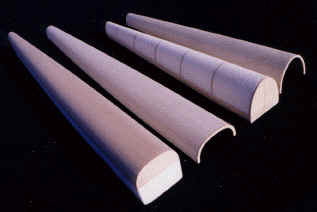 The leading edge foam will be cored out span wise creating a D tube. The trailing edge, wing root and tip will remain solid foam. By adding the tip sheeting the wings torsional rigidity is increased substantially. The vertical rib braces and rib cap strips are added after the foam is removed. 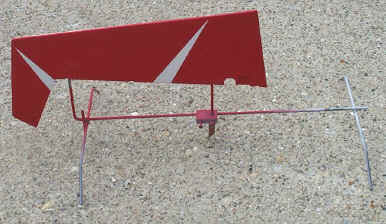 This wing is a Control line aerobatic airfoil that is going to be used on a sweet stick. The fuselage in the rear of the photo is built up 1/4" sticks aft of the trailing edge to save weight. The tail feathers are also 1/4" stick construction. It will be interesting to see how it flies due to the light weight and increased control surface areas. There will be a servo box constructed into the wing about 1/2 of the way out into the panel. When it came time to mount the kill switch without the proper cutout in the cowling I used See Temp as a guide for marking the cowling. A cutout was made in the See Temp and placed over the switch. The See Temp was taped in place aft of the cutout to the fuselage. The See Temp was pulled back while the cowling was installed and marked for the cutout. Mark the cutout onto the cowling and cut hole for the switch. This is a neat way to transfer cutout areas and have them line up exactly where you need them. Here are a few balsa shells and their molds that were molded by Steve Starr for his C/L stunter. One shell is the turtledeck and one is the belly pan. The Article below is written by a top control line flier Windy Urtnowski. For More Building Tips Visit The Scratch Building Reviews Page. "shells." This is especially true when light weight and maximum strength are priorities. strength derived from the grain. Another benefit is that there is almost always a savings in time. quickly than it would take to hollow out the block. "thick" hollowing techniques, you will benefit even more. designs, and they get used regularly. succeed right away and avoid pitfalls. Some fuselages with complex or convex shapes may not be good choices for your first attempt. and even if you don't, making corrections is very easy. Let me take you through a typical fuselage top, as an example. Build the fuselage up to the point of carving the top block. Tack glue your block on and carve to final shape, but don't final-sand yet. but six to eight-pound wood will work fine, with just a bit more carving. to insure symmetrical side-to-side profiles. Pop off the block now-you need to reduce its size slightly. One effective way is to take a marker pen and "paint" the wood surface. Once you sand this off, you've under-sized the plug it by about 1/32 of an inch. but don't worry if you make it a bit too small-there's a trick I found to fix that easily. finished shells are quite flexible and forgiving when final installation time comes. First, cut or sand a slight radius on the joining bottom edges of the block. outline of the carved block to the base piece-do this carefully. with a hollowing knife, and your mold is ready for a test to see how accurate it is. might think at first, and even if you demand perfection, it isn't difficult to attain. whole mold and the sides of the base when wrapped around. outdoors, if possible. Windex and water should be used if you're sensitive to ammonia smells. They work almost as well as ammonia-just allow a little extra soaking time. kind that stick to themselves. They're available in a drug stores and last forever. it's done, so it won't unwind while everything is drying. Let this dry 24 hours with the bandage in place. The next day, unwind the wrap, and peel the shell off carefully. You'll see the impression of the wire on the inside face-trim off the extra wood at this time. before installation. Once you're satisfied with the shell's fit, it's ready for a final sanding. for best results. This works great, and I recommend it. If the shell is too big, sand down the mold some more and make another shell. of shells for different designs. you can make custom shells for almost every model. squeeze out almost all the extra resin, making an extremely strong, extremely light part. wrap it in the direction opposite to the grain of the outer lamination. seams on the inside and fine-sand the final exterior joints. I videotaped the whole molding operation for modelers who'd like more information. The tape is a full two hours long and is available from John Brodak. by not having to buy another block, you can take your wife out for pizza. Using this technology, you'll quickly see other parts that lend themselves to molding. leading edge sheeting, or just carve out a mold piece from styrofoam. I've made wrapped stabilizer and rudder leading edges, and hollowed rockets for my F-16. Once you run off a few parts, you'll have ideas of your own, too. It's a modeling technique you'll find many unique uses for. Fuse Painting fixture complements of Steve Ragsdale. Steve used a rotisserie grill motor for his fixture rotation. Steve went so far as to install a foot switch to rotate the airplane. When you see a run coming on you just step on the switch and keep her turning. The motor can also be turned by hand and the gears in the motor holds the plane in position without rotating. I have used this fixture to paint the fuse all the way from the first coat of dope to the last clear coat. Masking was also done on the fixture. All of the graphics are painted with the exception of the round logo on the vertical stab. The type in the decal were just too small to paint. Tutorial on how to paint checkers and apply Ultra Coat checkers of all shapes and configurations CLICK HERE. Since the control surfaces of the Citabria are applied to the model after painting there had to be some way of holding these parts. I made some fixtures years ago for my control line models that were adjustable enough to work on a variety of shapes and configurations. The fixtures were constructed from 1/8" music wire with Delrin slider blocks with 4-40 set-screws to adjust the spacing of the uprights. The upright coming out of the Delrin block has a tab to insert into a flat hinge slot. The Citabria utilizes Robat Hinge Points so the 1/8" music wire was inserted into the hinge holes. The fixtures used for the ailerons are the same except for the length. The Balsa USA Citabria cowling is ABS plastic and is used as a plug to make a mold for a fiberglass cowling. 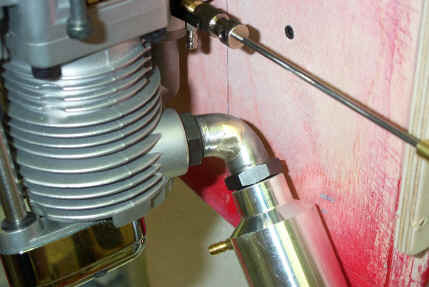 Before the cowling is suitable for a plug it has to be reworked. The seams of the ABS cowling sink in and need to filled with epoxy and micro balloons. Phenolic micro balloons are used hence the red color. (Glass micro balloons are white). Once the micro mix has been applied to the seams and low spots a peel ply is applied to the micro mix. The peel ply allows you to work the filler down and spread with your gloved fingers. The peel ply used here is the good old Sig Koverall. Since it is a polyester fabric epoxy will not adhere to it. Once the peel ply is removed then the micro mix is sanded to blend in with the rest of the cowling. This might take a few applications before the cowl is suitable for a plug. Peel ply also leaves a bondable surface on those projects that require secondary bonding. The modified Saito header. I ran in to a problem with the header positioning the muffler too far aft so as to interfere with the firewall. Since the belly pan came up to the firewall the firewall cut out option was out of the question. Flex pipe would work but that would mean having to mount the muffler to keep it from flopping around. The alternative you see here is a braze joint. A pie wedge was cut out of the inside section of the header bend. Once the extra material was removed from the inside bend of the header it was bent together thereby closing the gap and brazed. The material on the outside of the bend is adequate to strengthen the joint (hopefully). I am happy to report that as of 11-14-01 after about two gallons of fuel that the header is holding up fine.